We went to the London Film & Comic Con yesterday and it was brilliant! I could stay there all day long! So many coll stuff to buy and so many interesting people to meet. And I even met a German bloke who works for lightspeedfineart! So cool! I met the owner of the company years ago on a Star Trek convention and he was the one who organized a autograph from John deLancie for me. The world is such a small village. Anyway, there were lots of people in cool costumes and you could hear many of them going mad if they spotted something they liked. So much fun! Lightsabers, fanzy weapons, masks, figures, comics, T-Shirts and all the stuff you really don’t need but which makes your geeky heart feel so much better. And sadly we found someone who sold sword replicas from movies and series like Highlander, Heroes, G.I. Joe and so on…. And what can I say? Neil bought us two beautiful Katanas! On from Heroes for himself and the G.I. Joe from Snake Eyes for me. And you now what? Neil’s got even a sharp blade! And WHAT a sharp one! I tried it in the backgarden and ist goes through the branches like a knife through butter. 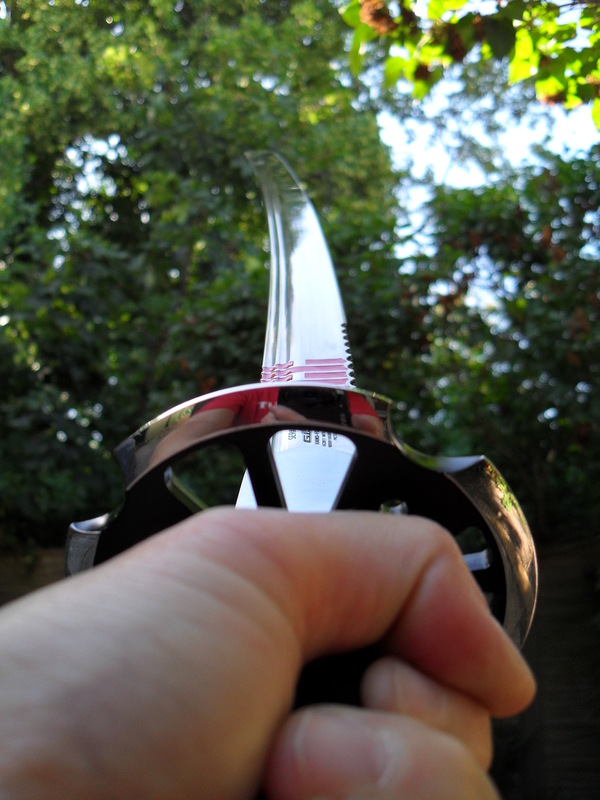 The Snake Eye Katana hasn’t got a sharp edge….sadly…but it’s beautiful! The base is wonderfully designed and it even got a bag to protect your sword. I know what you’re thinking now…how can a woman be so mad when it comes down to swords? Honestly? I don’t know either! But who cares? I love swords and knifes. They’re such a brilliant piece of craftsmanship and if there is anyone out there who need an apprentice for weaponsmith….please get in touch!!! Maybe I should consider to go to a Dojo and learn Kendo. So I could finally learn how to use a sword. Maybe that would scare of the evil weed in our backgarden. Laugh. Until then I’ll just keep on adoring them and clean them and just being geeky and freaky about them. And since you CAN buy swords over here as well, I think that it wouldn’t be any problem to bring my beloved mediaeval weapons over in September. Wish I had known that earlier…but my old sword is in good hands and it’s new owner will keep good care of it. Right that shall be it for today. Hope you’re all well. Take care and may the dark side of the Force be with you! This entry was posted in Uncategorized and tagged comic, con, film, katana, swords, training, weapon. weaponsmith. Bookmark the permalink.